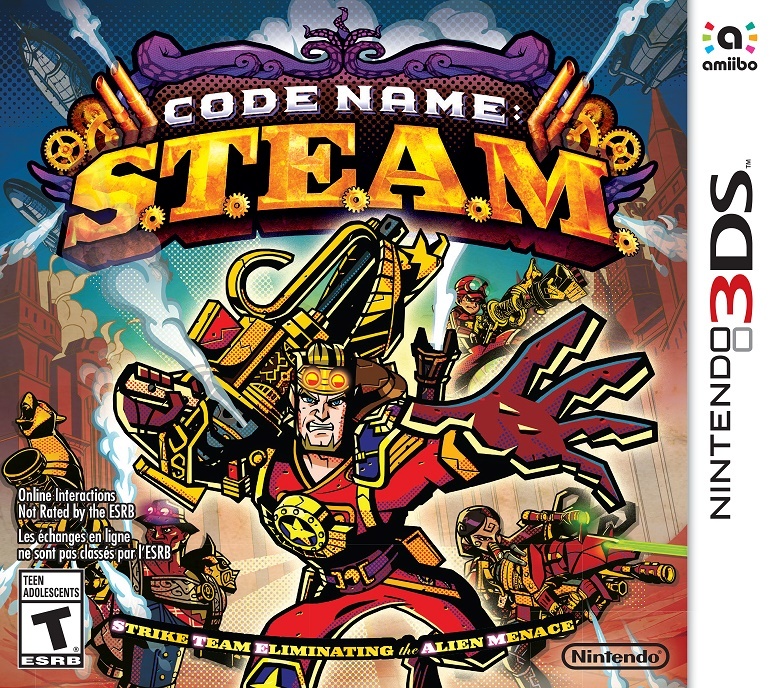 Developed by Intelligent Systems, the creators of the beloved Fire Emblem and Advance Wars series, the single- and multiplayer turn-based strategy game Code Name: S.T.E.A.M. launches for the Nintendo 3DS family of systems on March 13. The game places players on the front lines of a series of intricately designed battlefields and requires them to use both brains and brawn to emerge from battle victorious. Players are thrust into the boots of some of the most original and unexpected playable characters ever assembled in a Nintendo video game. These agents of S.T.E.A.M. (Strike Team Eliminating the Alien Menace) are composed of literature- and folklore-inspired icons like John Henry, Tiger Lily, Tom Sawyer, Lion from The Wonderful Wizard of Oz and many more – all led by Abraham Lincoln. Players who dive into the action on New Nintendo 3DS XL can even take advantage of the new system’s enhanced controls and creative amiibo functionality. Steam is a critical component of the game play. Each selectable agent in the game has a boiler on his or her back that generates a certain amount of steam every turn, allowing the player to move and fire at enemies. This simple and intuitive concept leads to many deep and strategic game-play choices. Moving forward across the battlefield uses steam, but players can also explore and then backtrack with no loss of steam, letting players scope out the surroundings and uncover hidden enemies. To add to the strategy and uniqueness of the steam mechanic, players that leave steam in their reserves after a turn can potentially attack during the enemy’s turn by using “Overwatch.” These Overwatch attacks can be performed by equipping specific weapons. 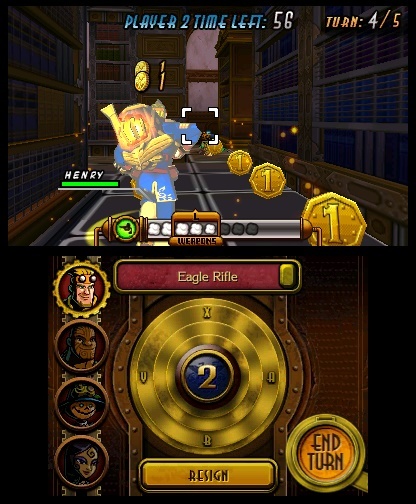 Before beginning each mission, players select a four-member team composed of the game’s many playable characters. As players progress through the wild story, more and more surprising characters will join the strike force, each with his or her own unique primary weapon and ability. 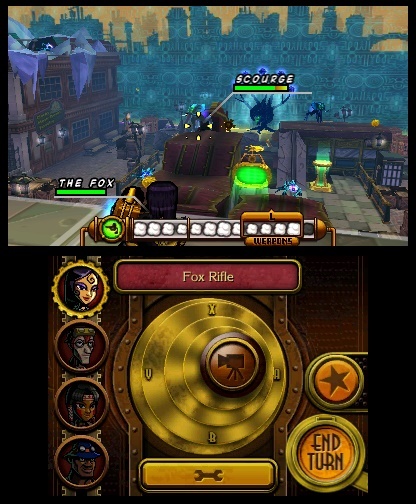 Because of the multitude of characters and the vast, well-designed maps, players can approach each stage using different techniques. Players might want to keep their characters together and deploy a full-on attack, or split them up and sneak around corners to scope out the surroundings and take the enemy on with a more stealth-like approach. In addition to each character’s main weapon, the eclectic agents also possess various secondary weapons and boiler packs that can be equipped before each mission. Want to outfit the powerful John Henry with a secondary weapon that provides him with an Overwatch attack option like the Steam Crossbow? No problem! The deep customization options add a whole new layer of strategy to the game, and encourage playing and replaying the game’s numerous missions in new ways. The game also offers three different multiplayer modes that pit player against player in exciting local battle modes, or online with a wireless broadband Internet connection. In Death Match, players try to defeat all the enemies on the opposing team to win. Medal Battle asks competitors to earn the most medals after five turns. And in the epic A.B.E. Battle, players pilot massive presidential mechanical robots and battle to victory. Players can even join online tournaments or create their own! Anyone who plays Code Name: S.T.E.A.M. on a New Nintendo 3DS XL system can experience some additional fun features. In addition to controlling the camera with the C-Stick and basking in the game’s striking graphics using face-tracking 3D, Code Name: S.T.E.A.M. is one of the first Nintendo 3DS games to feature amiibo compatibility using the built-in NFC technology on New Nintendo 3DS XL. If a Fire Emblem amiibo character like Marth or Ike is tapped on the touch screen of the New Nintendo 3DS XL system, he will join the battle as a playable character in the game. But just like in the Fire Emblem games, if these amiibo characters fall in battle, they are gone permanently – well, at least until players tap them in again at the start of the next mission. Code Name: S.T.E.A.M. boils over in stores, in the Nintendo eShop on Nintendo 3DS and at Nintendo.ca on March 13 at a suggested retail price of $44.99. This entry was posted on Thursday, March 12th, 2015 at 3:44 pm and is filed under National News, New Releases, RTS, Teen. You can follow any responses to this entry through the RSS 2.0 feed. You can leave a response, or trackback from your own site. » 2015 » 03 » 12 » Battle Aliens Using A Star-Spangled Strike Team In Code Name: S.T.E.A.M.